The naughty Viewtalay Beach 5 is one of the most popular of our residences. 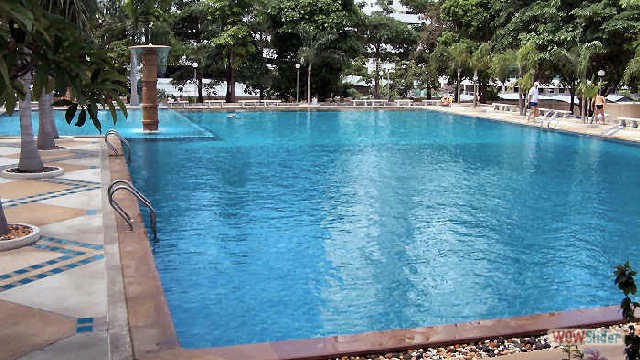 Its direct access to the beach (by magnetic card) without road to cross, its beautiful swimming pools, a guard 24/24 doubled by a video surveillance, its proximity to transport, make it one of the most requested in Pattaya. ..
At Viewtalay 5 there are studios of 48 m2 and apartments of 92 m2 or even 140 m2. All benefit from the best locations with sea view from a large furnished balcony (table with 4 chairs and lounger). For a naughty and turbulent vacation, this is really the place. Studio of 48 m2, located on the 9th floor, 10 minutes from downtown Pattaya, Bus Station for the airport 150 meters. Security 24h / 24, taxis, large pool, restaurants, supermarket, laundry, bank, large parking, rental cars and motorcycles. Taxi bus Pattaya - Jomtien nearby. Comfortable studio: balcony, air conditioning, cable TV, DVD player, 1.90 m bed, leather lounge, dining area, luxury decoration, "total screen" curtains, linen, towels, personal safe, kitchenette with electric hob, hood, fridge two doors with freezer compartment, crockery, toaster, coffee maker, microwave oven, electric kettle, storage, nice bathroom, shower with hot water. Rates per month, low season: 14,300 baht, high season: 23,100 baht. Studios of 48 m2. Beautiful sea view. and 10 minutes from downtown Pattaya. Security 24h / 24, taxis, very large swimming pool, restaurants, mini-market, laundry, large car park, bank, rental car and motorcycle. Very spacious, all comfort: Terrace, air conditioning, cable TV, DVD player, bed 1.90m, leather lounge, dining area, luxury decoration, curtains "total screen", sheets, towels, personal safe, kitchenette with electric hob , hood, fridge two doors with freezer compartment, crockery, toaster, coffee maker, microwave oven, electric kettle, storage, nice bathroom, shower with hot water. Rates per month, low season: 15,600 baht, high season: 23,300 baht. Communicating studios of 48 m2 each (total 96 m2), beautiful sea view, located on the 8th floor, direct access to the beach and 10 minutes from downtown Pattaya, Security 24h / 24, taxis, large pool, restaurants, supermarket, laundry, bank, large parking, possible rental cars and motorcycles. Spacious, all comfort: balcony, air conditioning, cable TV, DVD player, 1.90 m bed, leather lounge, dining area, luxury decoration, "total screen" curtains, linen, towels, personal safe, kitchenette with electric hob , hood, fridge two doors with freezer compartment, crockery, toaster, coffee maker, microwave oven, electric kettle, storage, nice bathroom, shower with hot water. Rates per month, low season: 31,200 baht, high season: 48,600 baht. Apartment of 92 m2, located on the 9th floor, sea view, and 10 minutes from downtown Pattaya, bus station for the airport 150 meters. Comfortable suite: balcony, air conditioning, cable TV, DVD player, 1.90 m bed, leather lounge, dining area, luxury decoration, "total screen" curtains, linen, towels, personal safe, kitchenette with electric hob, hood, fridge two doors with freezer compartment, crockery, toaster, coffee maker, microwave oven, electric kettle, storage, nice bathroom, shower with hot water. Rates per month, low season: 26,000 baht, high season: 38,500 baht. Apartment 140 m2, located on the 9th floor, sea view, 10 minutes from downtown Pattaya, bus station for the airport 150 meters. Comfortable apartment: balcony, air conditioning, cable TV, DVD player, beds 1.90 m, leather lounge, dining area, luxury decoration, "total screen" curtains, linen, towels, personal safe, kitchenette with electric hob, hood, fridge two doors with freezer compartment, crockery, toaster, coffee maker, microwave oven, electric kettle, storage, nice bathroom, shower with hot water. This apartment is the twin of a suite of 92 m2 and a studio of 48 m2, they are communicating through an interior door, so there is in this apartment a studio that can be independent. Rates per month, low season: 41 700 baht, high season: 63 800 baht.